Few foundation communicators claim they regularly – if at all – formally evaluate their work. To help, the Communications Network has published Are We There Yet? 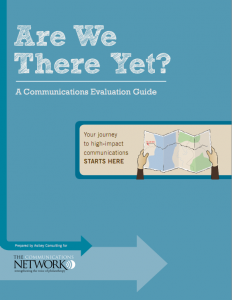 A Communications Evaluation Guide. Created by Asibey Consulting, and made possible by the David and Lucile Packard Foundation, the guide walks users through a nine-step process for creating plans for monitoring and measuring their communications. In developing the guide, Asibey Consulting surveyed more than 80 foundation and nonprofit communicators, conducted 20 in-depth interviews and extensively reviewed existing resources and reports. In addition to step-by-step planning advice, the guide includes several case studies from the Lumina Foundation for Education, The Wallace Foundation and others where the data from evaluation efforts helps communicators achieve their goals and direct limited resources wisely. Evaluation improves the effectiveness of communications. Evaluation can help organizations more effectively engage with intended audiences. Situations change – strategies and tactics may need to change as well. Evaluation ensures wise allocation of resources. Once evaluation is underway, the guide suggests you communicate your findings to people who may benefit from what you are learning, such as your team, your board or colleagues and peers. The report was written by Edith Asibey, Toni Parras and Justin van Fleet of Asibey Consulting. You can read the guide online or download as a pdf here. Also to view an introductory webinar about the guide and how to use it, click here. In addition, The Communications Network has made arrangements for the 40-page guide to be printed on demand at a per copy cost of $8.00, plus shipping. To order, or for more information, click here.